Recently I had the pleasure of being involved in a music video shoot for Jonathan Strickland, a rapper from Huntsville, AL. He’s very talented and in his song Hope City he makes several references to comics and pop culture. Specifically, he references Tony Stark, Michael Scott, Superman, Pepper Potts, Bruce Wayne, Bane, Killer Croc and Wolverine. Strickland is down to earth, super nice, and knows how to work a crowd. 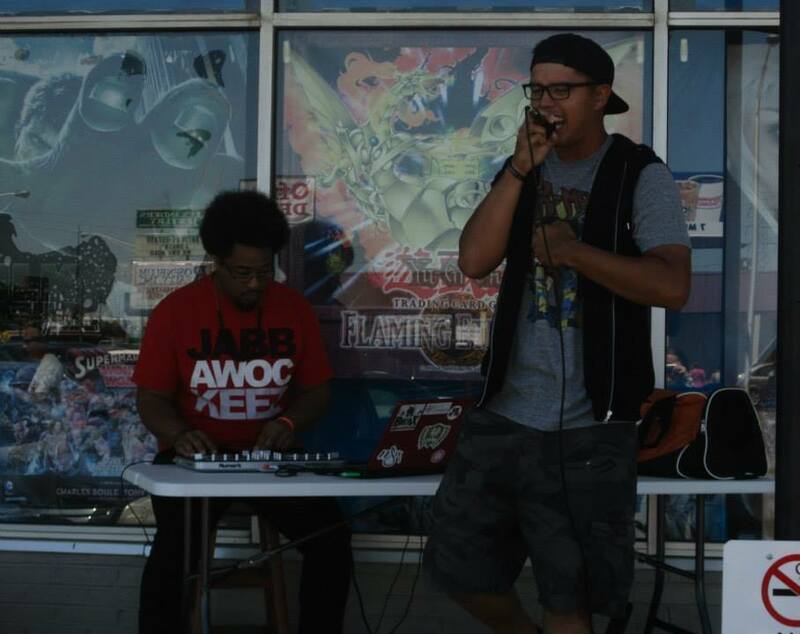 Strickland (pictured right) outside "The DeeP Comics" in Huntsville during national Comic Book Day. The organizer of the music video shoot is a good friend of mine whom I met at National Free Comic Book Day this year at The DeeP. When I first met Jason, he was taking video asking people who they were cosplaying as and why they were there (and everyone would obviously say “free comics”)1. It was a promotional video for The DeeP. When he released the promotional video he added in Strickland’s song Hope City. Strickland liked the video so much he asked Hough about shooting a music video for him to help promote his music. Hough responded with something extraordinary. 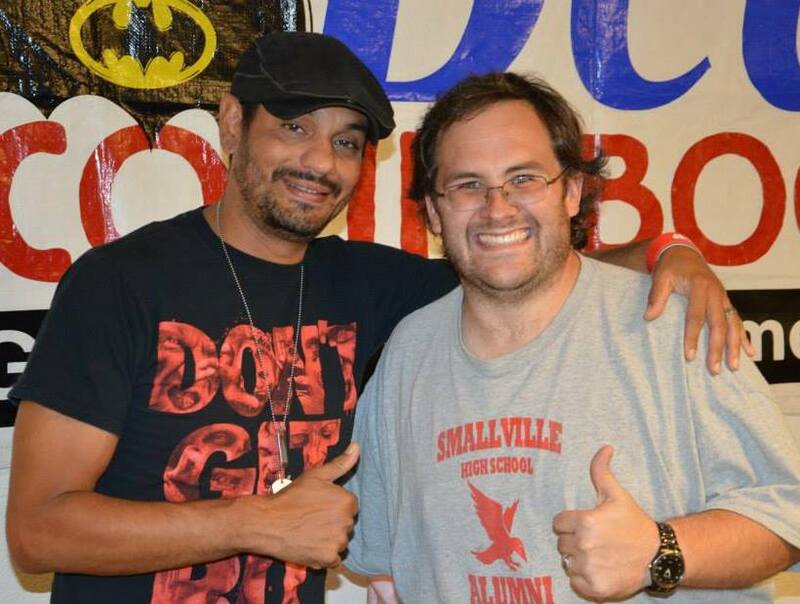 He had recently met Santiago Cirilo (Julio from The Walking Dead) at a convention. He was able to get Cirilo to agree to be in the music video. Securing Santiago was only one piece of the puzzle. Hough had already worked out a great premise but he needed a good supporting cast. 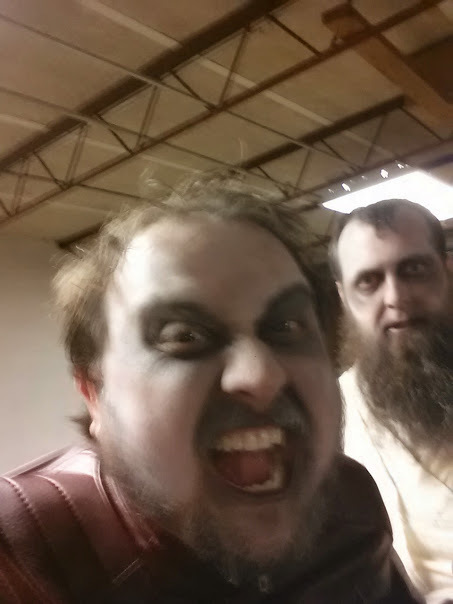 The premise was simple: there is a zombie outbreak at a comic convention. So a call went out over the internet for cosplayers and zombies. By having Santiago involved, excitement was increased and participation was high. It was only fitting to have cosplayers in the music video since the promotional video for The DeeP is what got the ball rolling. The premise also fit the song pretty well considering the vast geek culture references. Additionally this video shoot was a great opportunity to promote Santiago, Strickland, The DeeP, Blogmen Media, Sylvester Photography, and Sparky Cosplay. The music video was shot in two afternoons and while I was there I met some great new friends. Everyone acting in this video really got into it. On night one, I was dressed as V for Vendetta and during one of the shots a zombie girl was so intensely acting that she actually ripped my pants. Luckily my pants stayed together (for the most part) until I got to my car to change into some others. On night two I dressed as Smallville’s Clark Kent and I got the opportunity to get zombified. 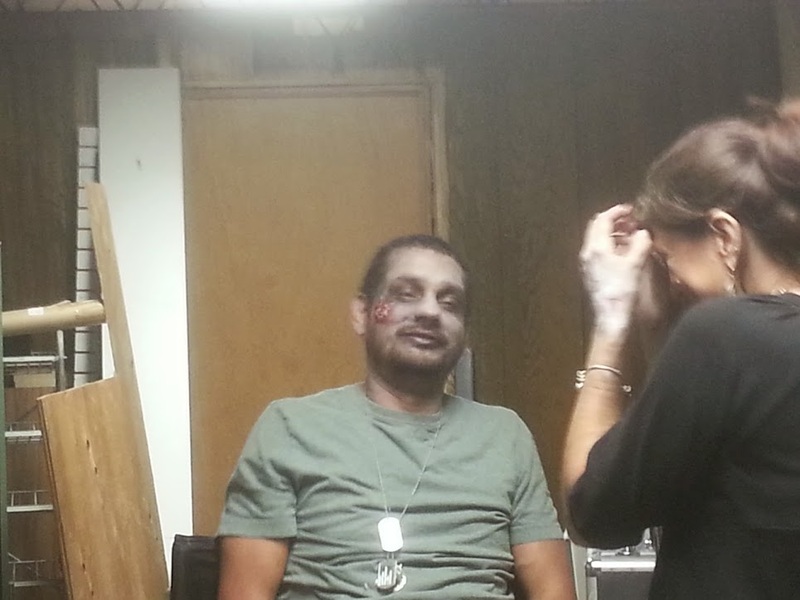 By the time the night two was over, we all felt like a bunch of Zombies. Even Santiago. But I wouldn’t trade in the experience on anything. The music video will premiere at The Geek Gathering in Sheffield, AL (September 20-21). In the past I’ve talked about the return of the 60’s Batman and the return of your favorite characters from Ghostbuster’s in the form of comics. In the future, I’d like to talk about the resurrection of the 80s Battlestar Galactica (yes there is a comic!). 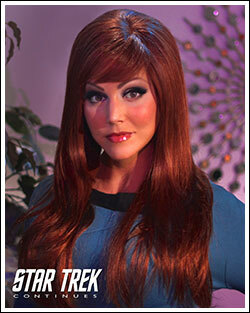 Today I’m talking about the fan made web series called Star Trek Continues. This is a continuation of Star Trek TOS (the original series). I’m not sure where on the internet I found this series, but I’m really glad that I did. The quality of this production is top notch. Admittedly, I’ve only seen the vignettes and the first episode “Pilgrim of Eternity”. The sets and the color palette of the show match up perfectly with the original series. They even shot the show in a 4:3 ratio. Captain Kirk is played by Vic Mignogna, the producer of the show. Most of this is paid for out of Vic’s own pocket. Because these are fan films, they can’t make a profit off of this show, which is a pity, because they are awesome! Vic’s acting skills are decent, he’s no Shatner, but I’d love to shake this man’s hand for the awesome work he’s done on this show! 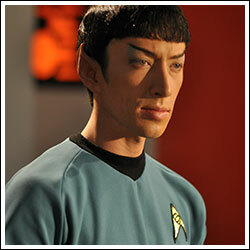 Spock is played by Todd Haberkorn. Haberkorn is known for a couple of anime films and also played a Police Officer in 2009’s The Collector. He is very good at portraying our emotionless friend. Michele Specht plays this new character who is the ship’s counselor. She does a wonderful job of being a lovely lady aboard a star ship surrounded by a bunch of dudes. It’s good to see some estrogen added to this cast. Michele is known to Sci-Fi fans as insane bounty hunter Red in “Fallout: Nuka Break”, and as Betty the Manipulation Core in the Portal-based “Aperture R&D”. 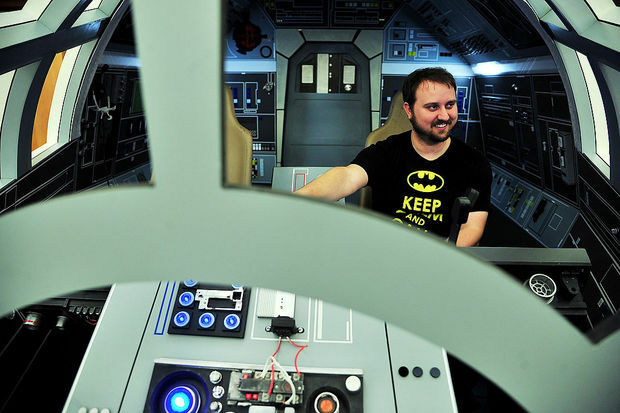 Christopher Doohan, the son of James Doohan, has reprised his father’s role as Scotty! After doing some web surfing, I found out that Christopher Doohan is not new to being in Star Trek films. 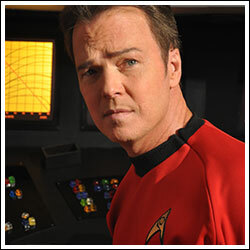 He has made cameos in Star Trek: The Motion Picture, Star Trek (2009) and Star Trek Into Darkness. 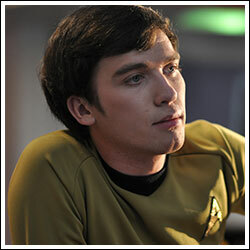 His acting is perfect and before I knew he was James’ son, I thought he looked a lot like the original Scotty. Now I know why! Larry Nemecek plays the Dr. McCoy (Bones) in the first couple of episodes. His acting isn’t great, but he’s a huge Star Trek fanatic. He is best known for his work on The Green Girl (2014), The Con of Wrath and Trek Nation (2010). 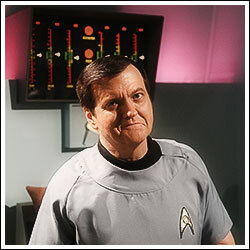 Side note: you can watch Trek Nation on Crackle.com for free. Chuck Huber plays McCoy in the vignettes and in the third episode and after watching the vignettes, I think he’s a better fit for the role. 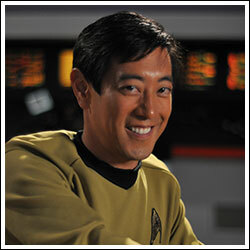 Grant Imahara plays the part of Sulu. If he looks familiar, it’s because he’s on Mythbusters. His accent seems a little pushed, but he’s a pretty good Sulu. Kim Stinger plays the role of Uhura. Her version of Uhura isn’t quite as proper as the original, but I’d say that is a good thing. 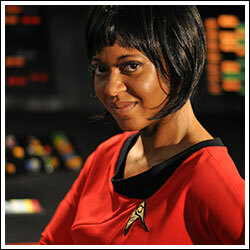 She also played Uhura in Star Trek New Voyages, another continuation fan series. 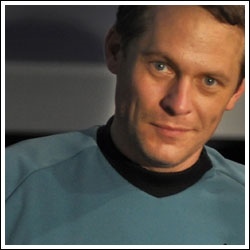 Wyatt Lenhart plays the part of Chekov. After looking at his IMDB profile, it looks like this the only work he’s done. Does he sound Russian? Yes. Is he young? Yes. Sign him up! I think he does a fantastic job. With the introduction of the cast and crew out of the way, I’d like to introduce you to the show by this great interview that I found. As our quest for the biggest Aquaman fan continues, I’d like to introduce you to the origins of Aquaman.